Charleston is a delightful place to visit (providing you go either in spring or fall). Much of the delight is due to the exploding culinary scene, which focuses on local ingredients from the Lowcountry prepared in a range of ways from rustic to sophisticated. There doesn’t seem to be any end to the public’s fascination with Southern cuisine, and after dining in Charleston it’s easy to figure out why. Since Blossom is part of a restaurant group that includes both Cypress and Magnolias, and since Magnolias ignited the culinary revolution in Charleston restaurants when it opened in 1990, you might expect Blossom to be on the same level. Based on a recent visit, you would be wrong. The restaurant is certainly attractive enough, with an open kitchen and a well-lit, breezy atmosphere, but the food served to our party of eight was less than disappointing. Many dishes were inedible, and one entrée had to be sent back twice---despite the presence of a manager expediting orders and inspecting them before they went out. It was no better the third time around, but we didn’t have the rest of the day to wait for the cooks to get their act together. Think the grand era of fine dining is over? Pay a visit to the Charleston Grill, and discover that luxurious indulgence has simply been adapted and reconfigured for the new millennium. 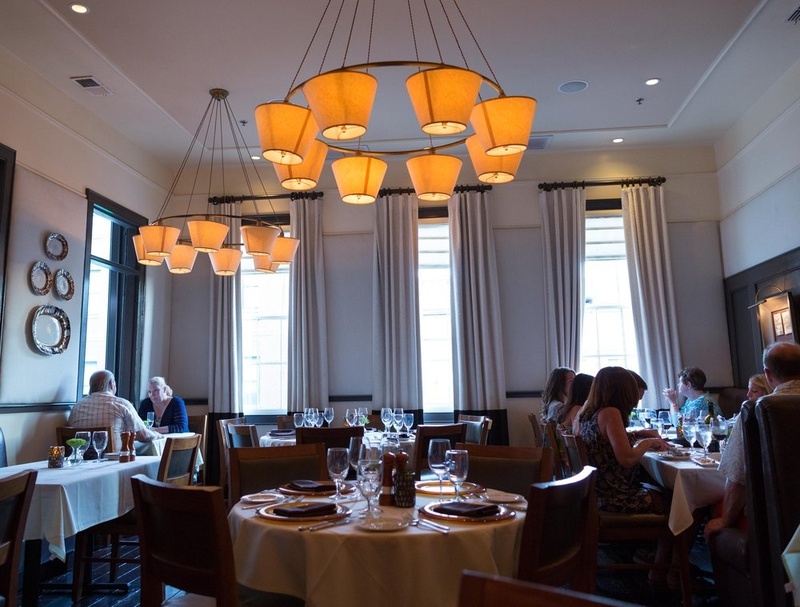 Located in the Belmond Charleston Place Hotel, an enclave of civility operated by the Orient Express Group, the square dining room is decorated in warm earth tones framed by wood paneling and oil paintings; a wine-themed private room juts off to one side. One corner is dedicated to the musicians who serenade diners with strains of live jazz. The innovative menu is divided into four sections (Cosmopolitan, Southern, Pure and Lush) and offers a parade of delights ranging from seared foie gras and octopus to sweetbreads, squab, and venison tenderloin. Diners may mix and match dishes from the four different culinary themes, as they would do at Café Boulud. One of the signature starters is a remarkable, densely packed crab cake, garnished with creek shrimp and offset by a lime-dill vinaigrette. If you’re feeling adventurous, the entrée to try is the Thai Fish---two fillets of red snapper resting in a bowl filled with a sweet and spicy shrimp broth, studded with pineapple, cherry tomatoes and chopped scallions. It’s a dish best eaten with a spoon. The heat is noticeable enough to make you sit up straight, but not strong enough to elicit a whistle. To top things off, you may indulge in one of the best wine lists in Charleston restaurants, a seemingly endless tome of carefully chosen wines that you’ll rarely see anywhere else. And after several bottles of a perfectly aged, ten year-old Meursault, you’re likely to conclude that the world isn’t such a bad place after all (224 King St., in the Belmond Hotel; (843) 577-4522; charlestongrill.com). This place has been at the top of my list of Charleston restaurants for quite a while, but I’ve never succeeded in getting there. On my most recent trip, I visited the city with a group of eight. Fig has a strict limit on reservations for more than six people, and they’re vigilant about ferreting out large tables masquerading as split parties, so it never happened. What’s the attraction? Primarily Chef Mark Lata, who has actively helped revolutionize Lowcountry cooking over the past decade. His menus are enough to make your mouth water: king mackerel tonnato, borlotti beans in escabeche, paillard of cornflour dusted wreckfish, etc. Lata has tight connections with local fishermen, and has promoted local delicacies such as triggerfish that normally wouldn’t be on the gourmet radar. And the wine list? Grower Champagne, bottles from regions such as the Jura, a Charbono by the glass, etc. Someday! (232 Meeting St., (843) 805-5900; eatafig.com). Located on Upper King Street, several miles from the horse-drawn carriages of the historic district, Fish bills its food as “classic French cuisine with delicate Asian touches.” While this may or may not be accurate, the restaurant delivers fresh and artfully prepared fish in a myriad of forms. The menu combines an assortment of both small and large plates, along with a selection of dim sum and some interesting daily specials. The wine list is short, but extremely well-chosen. The atmosphere at Fish is casual, with wooden-topped tables and friendly service. There is a large and active bar near the entrance, and on busy nights (i.e., just about every night) the crowd gets a bit raucous. There’s not enough space between the bar and the dining room to insulate you from that noise, and lots of hard surfaces for the din to resonate against, so be prepared to crank up your own decibel level if you want to be heard. All in all, though, this is a delightful experience (442 King St., (843) 722-3474; fishrestaurantcharleston.com). The menu is a roll call of Lowcountry specialties: she crab soup, gumbo, fried green tomatoes, the inevitable shrimp and grits, and a cavalcade of local fish and shellfish. Begin with oysters on the half shell, sourced from a carefully tended, multi-generational bed near Beaufort: firm, briny and flavorful. 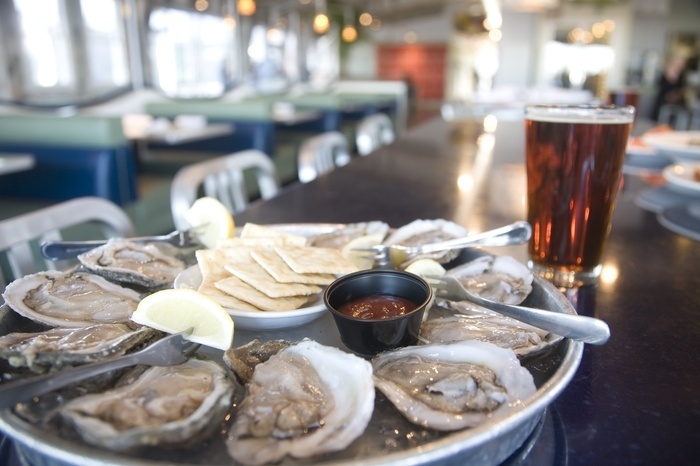 Don’t fret over the months ending in “r,” either---these bivalves are fresh at any time of year. Flounder is a fish that normally wouldn’t appear on the short list of many foodies, given that it tends to be out of the water at least one week before it hits our plates. 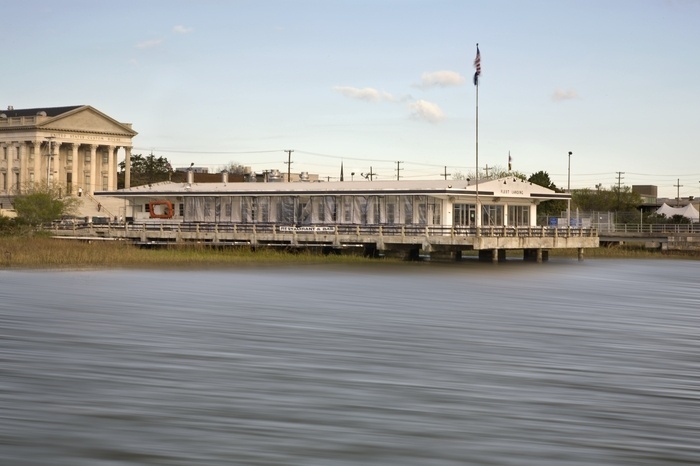 At Fleet Landing the fish is local, fluffy and tasty, delicately battered and fried and topped with an apricot glaze. If you’re new to South Carolina, try triggerfish, a firm and sweet white-fleshed variety native to the Outer Banks. And don’t leave town without sampling a Lowcountry Boil (jumbo shrimp, smoked sausage, corn on the cob, red bliss potatoes and diced onions simmered in a lager broth). Fleet Landing’s location is serene and isolated, yet the place is a short walk from the center of Charleston’s downtown historic district. In many ways, it proves that appearances are deceptive (186 Concord St., (843) 722-8100; fleetlanding.net). Halls Chophouse is a great restaurant that just happens to serve steak. Those steaks are USDA Prime from Allen Brothers of Chicago, and they are offered as wet aged, dry aged or grass fed. There is wagyu, served by the ounce ($26 per ounce sounds more palatable than $208 for an eight-ounce filet). The seafood is nothing short of spectacular, particularly the tender, perfectly cooked miniature lobster tails available as an appetizer, the ahi tuna or the seared scallops. A formidable battery of sides and sauces complements the main courses. Like most other steak houses, the wine list is heavy on California. Some are offered at hefty prices, but there are relative bargains: Far Niente Chardonnay ($70), Mira Cabernet ($82) and Robert Biale Black Chicken Zinfandel ($88). For those who want to go large, there is a nice selection of magnums and double magnums. Halls is a family-operated restaurant in the truest sense of the word, and there were three family members present on the night of our visit. They visited every table and engaged in personalized conversation with guests. This level of solicitude naturally filters down to the service staff, who are universally friendly, knowledgeable and efficient. The Hall family owns other restaurants in Charleston (Slightly North of Broad and High Cotton), but their hearts are clearly in this one (434 King St., (843) 727-0090; hallschophouse.com). Despite being owned and operated by the Hall family (see above), High Cotton is a hit and miss experience: they try hard, but something always seems to go awry. In truth, this place would be a stellar restaurant if it were located anywhere else, but the competition among Charleston restaurants is simply too fierce. The food is mostly very good, but on one visit I was served a piece of tuna that had so much vein and gristle that I couldn’t cut it with a steak knife. The service is mostly very good, but on another visit every staff member in sight (a total of seven or eight) had filthy aprons. After bringing this to management’s attention, I was informed that it was Sunday evening and all the servers had worked brunch, which was supposed to account for their appearance. A mirror, a napkin and some water would have remedied the situation nicely. If you can get past the glitches, you’ll find some interesting specialty cocktails, a menu with solid versions of Lowcountry classics, and a better-than-average wine list. There’s also a brunch with live music on Saturdays and Sundays (199 East Bay St., (843) 724-3815; highcottoncharleston.com). When it opened in 1990, Magnolias was the forerunner of the culinary explosion that was to take place in Charleston over the next few decades. It remains as exciting and innovative today. The interior is elegant and crisp, with starched white cloths covering a mix of free-standing tables and banquettes. As soon as you step inside, you know you’re in good hands. 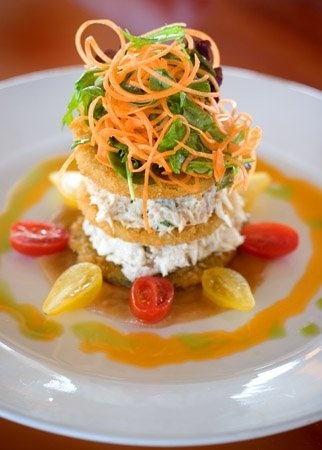 The menu is a graceful and upscale rendition of Lowcountry cuisine. Appetizers span a range from house made pimento cheese and fried green tomatoes to hickory smoked pork belly and a Down South Egg roll stuffed with collard greens, chicken and Tasso ham. 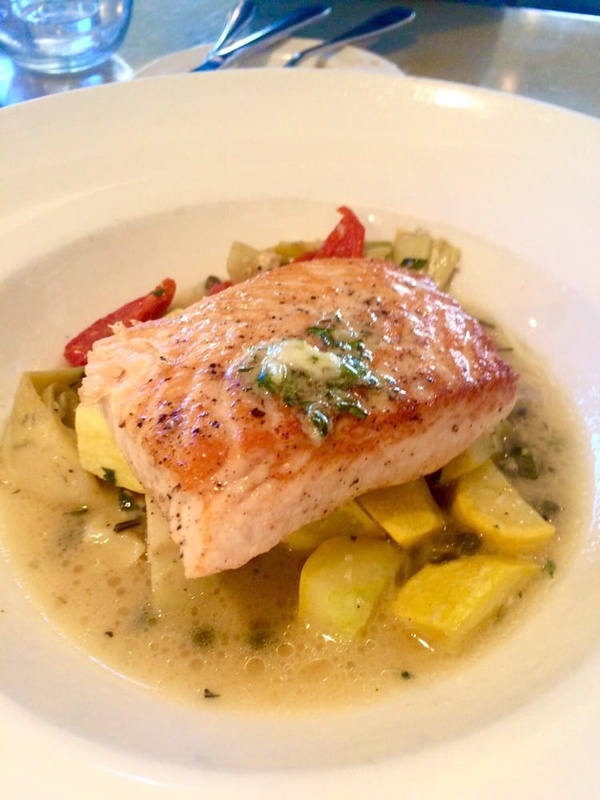 Standout entrees include a spectacular Cedar Planked Salmon, juicy and smoky, presented with a dramatic cascade of artichoke hearts, shaved fennel, chopped egg and green beans. Everyone in Charleston serves shrimp and grits, but the version here is both delicate and soothing: sea scallops and sautéed shrimp are placed over a bowl of creamy white grits in a lobster sauce studded with fresh spinach. While ham and bacon do appear in a number of dishes, those ingredients can be omitted on request. Service is friendly, accommodating and relaxed: the staff knows they have a good product backing them up, so their graciousness stems from the knowledge that you are bound to leave happy. The wine list is a collection of small-batch gems from California and France, well-matched to the menu. Who could ask for more? (185 East Bay St., (843) 577-7771; magnoliascharleston.com). Sean Brock is a celebrity chef of some repute, credited with being one of the prime movers behind the resurgence of Southern cooking. His flagship restaurant in Charleston, Husk, was named Best New Restaurant in America in 2011 by Bon Appetit magazine. He has won a James Beard award, written cookbooks, and been featured on an episode of Anthony Bourdain’s TV show. His empire now stands at five restaurants and counting. I’ve never met the man, but he's often portrayed as a bourbon-swilling good ol’ boy who is passionate about cooking, and he has legitimately championed local and heirloom ingredients from the Lowcountry. I’ve also never been to any of his establishments, for several reasons. In many of his dishes, Brock makes liberal use of ham, bacon, pork belly, pig’s cheeks and other swine-related raw materials. I don’t eat pork, and I don’t like celebrity chefs. I have no doubt that Husk is a restaurant worth visiting, but don’t think that you’ll be eating Sean Brock’s food there (the Executive Chef is a guy named Travis Grimes). Like many media personalities, Sean will likely be off somewhere else, starting or promoting another venture. They say there’s no such thing as bad publicity. You can make up your own mind. 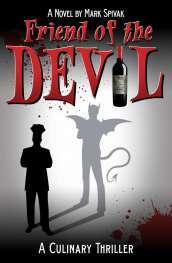 Do you agree with the reviews on this page? Do you have a personal favorite in Charleston? Give us your comments!